The Hot Chocolate website very informative and well laid out. The participant guide had all the information I needed to know — like course details, expo details, race day experience, gear check, after party, etc. I felt well prepared heading into the race weekend. The race shirts! Amazing. I had my bib and shirt mailed to me about a week before the race. I wasn’t sure at the time I registered that I would be able to get to the Expo or not, so this was a very convenient option. The medals look good — good enough to eat. They look like a big bar of chocolate. My kids were very impressed with it. All the Hot Chocolate races use the same medal and attach an additional little emblem to represent the city in which you’re racing. This was my first time travelling and staying in a hotel to race. The hotel we stayed in was the only hotel recommended by the Hot Chocolate website. They offered a discounted rate for race participants. It was really convenient staying at the same location as the Expo. I covered more about the hotel in my pre-race update. I do wish that breakfast was available just a little earlier. They didn’t open until 7am, so I had to skip breakfast since I needed to get to the starting line. I believe it was possible to order breakfast to your room from 6am. I probably got up too early on race day. I hate being late for things. I crept around the family in our hotel room, got ready and went downstairs to check the weather. It was supposed to be raining all morning but thankfully the rain was nothing more than a slight drizzle. Yes! It was a nice 50°F outside as well. Close to perfect running weather really. The start line was about a 15 min walk from the hotel. There was a runners staying at the hotel, but I didn’t really notice too many people walking. Again, probably because I was a little early. When I got to the start line, there was only a few of the 5K participants hanging around. The 5K race was due to start at 7.45 am. It was at this time I realized how the Corrals were going to work. They were basically just markers along the road that divided it into sections. The 5K had 3 Corrals – A, B and C.
After the 5K race got on their way, it was time for the 15K participants to get into position. To my surprise the A, B, and C Corrals were removed and Corral D was at the very front. I’d never started at the front of a race before. I was pretty pumped about that! The countdown started, it was time, 5…4…3…2…1! Starting Line: Yeah! I get to start the front! Plenty of room up here! Let’s do this. I’ll just tuck in here behind the 8:30/mi pacer. Mile 2: Oh oh. Here’s some up hill. This freaking hill is over a mile long. I’m dying. 8 miles to go! Mile 3: That was tough. Looks like the course is starting to level out now. Time to eat some Honey Stingers to see if I can get some pep back in my step. I think I need to pee. Dang it. Mile 4: Well, the 8.30/mi crowd has caught back up with me. I have to stay with these guys now for the duration. Have to…. COME ON! Mile 5: Should I stop to pee? No. Oh, there’s a guy using a porta-potty on that building site. Maybe I should stop. No, I can’t! Mile 6: Asking random people if they know of any more hills. I already know the answer to this, but I still gotta ask. 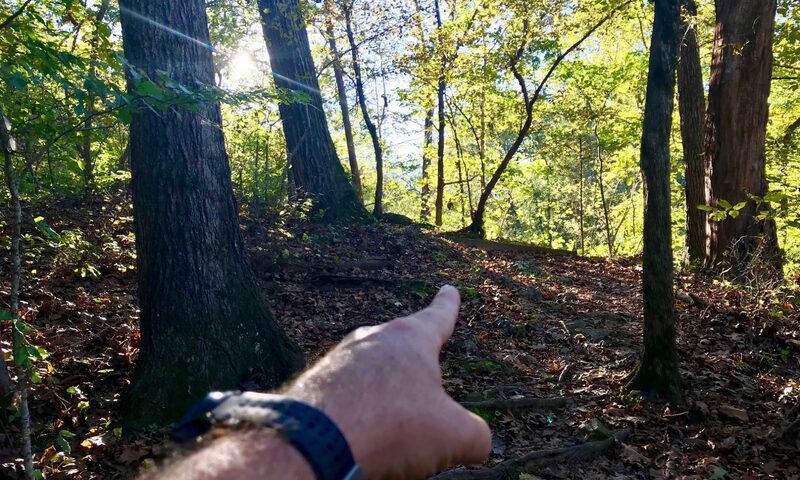 I’m running up a hill right now. Mile 7: Now this is feeling good. Finally, getting in the groove. Let’s do this. Mile 8: Oh my legs are soooo heavy. How far is 15k anyway? Is that a little granny racing ahead of me? How does she do that?! I’m taking you down, granny! Mile 9: The pacer is getting away from me. Wait, he’s running back. Says we’re nearly there! Time to spend all I’ve got!!! Finish Line: Oh man, check out my stride. I’m flying here… straight through the finish line!! I did it! 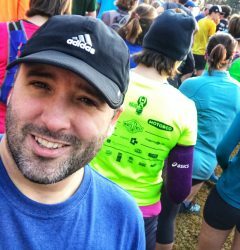 I crossed the finish line with 1:18:26 on the clock, 8.25/mi pace. I was really happy with that. I set an aggressive goal and beat it. I immediately began reassessing my goals for future races (particularly the Half Marathon I have in March). I loved how they called everyone’s name out as they passed the finish line. That was a really nice touch that I’ve not seen done before. As I watched other participants come through you could see the smile it brought to their faces. I made my way to the post race party area to claim my finishers mug. I’m not a big hot chocolate drink fan, but the actual real melted chocolate that was in the mug was soooooo good. There was also a number of items to dip in the chocolate — banana, pretzel, cookies and more. Another runner was kind enough to offer her a spare finishers mug token that he had, so that cheered her up a bit! This was a great service. My wife was able to sign up to this free service prior to the race. During the race it sent her text messages on my progress. Very cool feature. It sent updates on 5K, 10K and finishing paces. I noticed quite a few photographers on course and the race photos were completely free. I’d probably never buy a race photo because I look dead in most of them, but I love it when they’re free to download and keep. As soon as the race had finished, race photos were being updated to the results page. New photos continued to appear on there throughout the day. 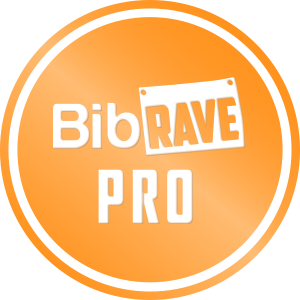 It was good to meet some of my fellow BibRave pros at the race. I bumped into Teddy before the race started, and then met Lissa afterward. It was not hard to find the bright orange BibRave gear against the grey backdrop.